No one ever said that finding the perfect mate was easy, but the Internet has put almost every single person in your locality at your fingertips. Even a few years ago, Internet dating meant tethering yourself to your computer. Thanks to mobile devices and location-sensing apps, however, the whole world has become your playground for dates, hookups and long-term relationships. Moreover, for the same reason we are here to give you the best one out of the pool of social apps. We selected Dice - Meet New People for you to satisfy your desires. 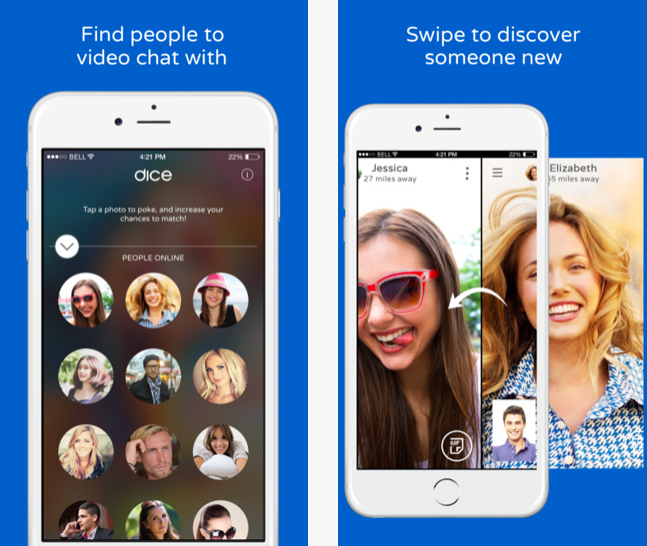 Dice - Meet New People Video Chat & Calls Messenger platform to get a face-to-face interaction with the new friend. The interface of the application is as impressive as it is clean. Once after successful installation, the launch of the app begins with a quick registration page. At the very outset, all one need to do is to enter the age and gender while doing the registration. Once done you are on the way to get the new friend to interact and build a good and fruitful relationship. The app supports a clear video quality and the voice quality during the call is audible. Through its discovery mode user can search people near to your place and its reputation points system let you analyze the quality of person you are trying to connect. The app supports wide range of stickers that you can use within your session. Analyzing the above-mentioned aspects, it is a worth trying out application available for both iOS and Android without any cost.